Automated lead nurturing is designed to address a very specific challenge for online marketers: most of your new leads (and perhaps even fewer than 1 in 10 website visitors) are really ready to buy when they first visit your website or convert into a lead. Lead nurturing is designed to continue the connection with the majority of new leads who are just starting the buyer’s journey and help guide them toward a purchase decision. While just having a lead nurturing program may put your company ahead of the curve (businesses who nurture leads make 50 percent more sales at 33 percent lower costs), there can be pitfalls along the way that contribute to the loss of leads. If you feel that you are losing too many leads midway through the funnel, review your lead nurturing program to see if you are making these 5 mistakes. 1.Your workflows don’t have a goal. Each lead nurturing workflow you create should have a specific endpoint in mind, whether than goal is for the lead to download an additional offer that is further through the sales funnel (such as a case study or a product solution video) or to request a consultation or contact from a sales rep. Your workflows should be set up to trigger a new action or workflow anytime the first workflow’s goal is achieved, whether that is after the first nurturing email or the fourth. For example, a workflow that is initiated when a website visitor first downloads an awareness level offer, such as a general ebook, might have the goal of the lead converting on a second offer that falls within the consideration stage of the sales funnel, such as a problem/solution sheet. If the initial conversion was for a consideration level offer — perhaps a case study — then the goal might be for the lead to schedule a meeting. 1. Goals guide your decisions as you choose what to include in each lead nurturing email. 2. Goals provide a concrete endpoint from which to take the next step. 2. You are pushing too much. If the first email a new lead gets from you goes right for the sale, you’ve missed the whole point of lead nurturing. Even pushing for the lead to access another offer on your website (with a progressive form seeking more information) right away can be turn-off. Account specialists at HubSpot, a pioneer in inbound marketing and lead nurturing, recommend first sending leads targeted useful content — with no strings attached — such as blog posts and ungated videos. Give them something before asking them to give you anything more, even in the form of additional contact info or commitment to a download. Use your lead nurturing emails to link to some of your most popular blog posts, providing additional SEO power through more traffic. By doing so, you are helping leads discover more about your company while providing them with valuable content that they can use (assuming you are using your business blog in the right way). Save the calls-to-action for additional downloads or a consultation for further down the workflow after leads get to know you a little better. 3. You aren’t providing enough information. B2B buyers say that one of the key stumbling blocks to the buying process is a lack of information — both applicable to their purchase and overall. In fact, lack of information was cited by more than 1/3 of respondents to a June 2018 Showpad survey as slowing the B2B buying process. Use lead nurturing to feed that need for information, first on a broader scale as you work to shift leads from awareness to consideration, then with more product or service specific information through a consideration-to-decision workflow. B2B buyers’ desire for information is evidence of the importance of quality content to the overall inbound marketing strategy, as it sets up a foundation for sales reps to work from and access. 4. You’ve made it too complicated. Sometimes we trip up ourselves as much as we trip up leads. At JONES, we believe in sharing ways to learn from our own mistakes. And one mistake we made early on, in our eagerness to follow best practices regarding personalization and keeping content and offers relevant, was to create individual workflows for each and every awareness level content offer we created. We had dozens of workflows. One for An Introduction To Closed Loop Marketing. One for 15 Business Blogging Mistakes & Easy Fixes. One for our On-Page SEO Guide & Planning Template. And on, and on. It was too complicated. And it didn’t provide an action for those assets that fell into the consideration phase should they be a lead’s first conversion. We’ve learned better since. Now, we simplify things into two — yes, just TWO — workflows based on what type of offer the lead converts on, rather than the topic. One workflow is for leads who convert on an awareness level offer, leading toward the goal of downloading a consideration level offer. The second begins when a consideration level offer is downloaded, with a goal, as mentioned above, of scheduling a meeting or consultation. Simpler for us, yet still targeted based on the lead’s needs. 5. Your workflow is broken. Of course, one of the most basic mistakes that could cause leads to get lost midway through the nurturing cycle would be a workflow that isn’t working properly. If somewhere in the “if-then” instructions a switch is flipped in the wrong direction or a mistyped word brings back a 404 error on a link, your workflow won’t achieve its goal. The first step to ensuring a workflow works the way it should is to be meticulous in planning. Map out a visual flowchart first to track how leads will move through the workflow. Then test the workflow before activating it, asking your test subjects to click every link in every email. You don’t want to lose a lead because of a simple error. 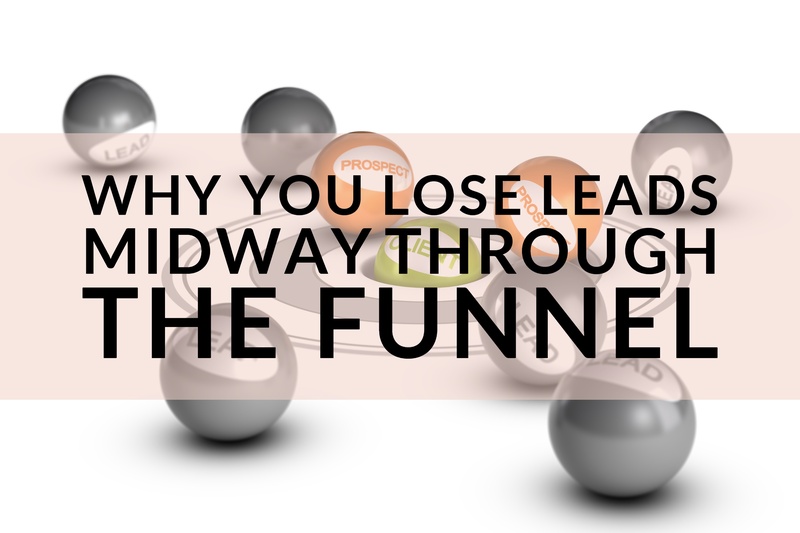 While we know not every lead is going to turn into a customer, there is no excuse for losing leads midway through the cycle due to correctable mistakes. Take time to check your own process for these missteps and find more tips and templates to aid your automated lead nurturing programs in our Lead Nurturing Toolkit. You’ll find a landing page template, lead nurturing workflow template and a lead nurturing workflow sample, all in a single download.